It was at the Banff Centre in the Canadian Rockies on a Walking and Art Residency in 2007 that an idea of a Museum dedicated solely to walking and art was developed by Andrew Stuck. Andrew Stuck (in cap) interviews Nick Hallersey from Country Walking magazine. The museum would be a showpiece for events around walking. It would promote walking and it would promote art and creativity and bring the two together. We chose to broaden it by inviting Co-creators to work together to create a variety of different walking opportunities. Our intention has always been to encourage people to dip their toes into trying new things, out and about on foot, giving them the chance of being more creative – “the art is in taking part”. The Museum of Walking runs walks and ‘walkshops’ and talks and ‘talkshops’. Each are designed with a different purpose. Our collaborations with festivals, museums and artists make each event unique. If you are interested in collaborating with us, check out our philosophy and if it chimes with yours, please do get in touch. Our Walking Creative (TM) experience will help you market and develop your idea and bring it to fruition. What you can expect from a Museum of Walking ‘walkshop’ event summed up in 3 words: entertaining, informative and fun. They are participatory walks that include either learning a new skill or making or creating something. The events we run vary. We try to categorise them (see below), but they have a habit of falling into more than one category! Discovery walkshops Curious to discover new places and new ways of seeing the familiar? These walkshops are guaranteed to stimulate the mind and always attract an interesting crowd. Curated – either: Artist led walkshops: expect to develop your artistic palette. We trace the history and culture of our environment bringing the past into the present. creating art along the way. Or: Artist inspired walkshops: expect to discover a new artist and to observe a neighbourhood through the lens of that artist. An example is “Sounding out Peder Balke” – a part audio, part sketching, part bricolage walk in which we evoke the landscape of Norway through which lesser-known 19th Century landscape artist Peder Balke walked. Technique Getting to know the nuts and bolts, the ‘nitty gritty’, familiarising yourself with ‘the rules of thumb’, or learning the ‘inside track’ are all things you can experience on one of our Technique walkshops. We bring along an ‘expert in the field’ and facilitate the learning environment out and about on foot in the big outdoors. Field Walks These include walkshops for practitioners and professionals working to improve the walking environment – Walking Geography in the making. This is where we incubate ideas and develop practical guides and toolkits. Are you Museum or Gallery educator, an app or games developer? Then we run Field Walks in which we test out apps, games and learning resources in the field. Mainly by invitation only. Are you a community champion or professional working to improve your local neighbourhoods? These walkabouts bring you all together as a ‘Show and Tell’ and offer insight into improving public space. From the development to the final walk, we find inspiration and get the creative juices to flow. Mainly by invitation only. 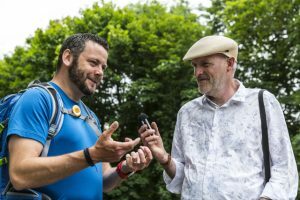 Please be aware that when participating in one of our walks or walkshops, photographs will be taken – to document what has taken place and that may be used in our publicity. If you do not wish to have your image taken, please make sure you inform the walkshop leader at the start of the event you attend. We also seek feedback from participants – immediately after a walkshop we will generally distribute cards on which we ask you about the experience you have had and whether you would recommend one our walkshops to a friend. We may e mail you later to gather further feedback as you reflect back on the experience. Conversations: Hugely popular events, these intimate gatherings join participants with a guest speaker to discuss topics of interest and enquiry. Numbers limited to 10. Talk the Walks: Here everyone is the panel, guaranteeing lively discussion on keen and pertinent topics. These are a variety of events for professionals or those who have a keen interest in the built environment, green spaces, public health and transport. Our popular networking meetings begin with quick fire introductions followed by lively debate on current thinking. A great opportunity to expand your contacts and meet the people who matter. Numbers at Talk the Walks are limited to 40. These events are always well attended and have gained respect and loyalty from participants. The most recent incarnation are Urban Tree Talks. Do get in touch if you have a subject you would like to deliver and we can support you to develop it into a Conversation or a Talk the Walk. You can get a feel for what we have created by looking at an archive here. We didn’t move to this website until 2015, so previous Museum of Walking events appear on our Rethinking Cities website. 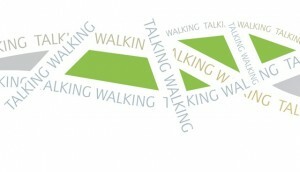 Meet our Walking Companions: Artists, institutions and organisations with which we have co-created walks and walkshops. Talking Walking – free podcasts to download and listen to – they are interviews with artists, activists, and professionals about how walking is a catalyst to their work. We have just published our 85th episode and are celebrating our 10th anniversary in 2018. Rethinking Cities – where you can find out about all the work we do to help practitioners in the built environment, public health and transport sectors improve the neighbourhoods in which we live and work. Geovation Housing Challenge Finalists 2015. 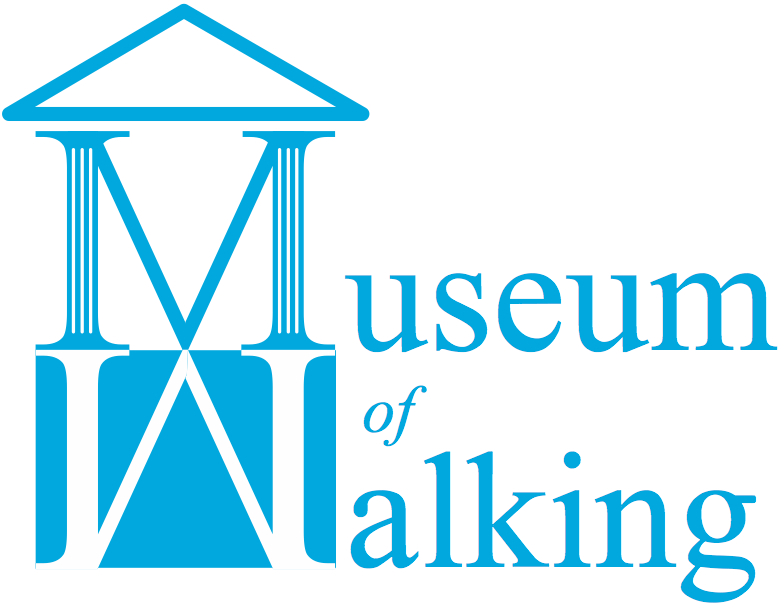 The Museum of Walking is presently a wholly owned subsidiary of Rethinking Cities Ltd Rethinking Cities, a limited company registered in Salford, and trading in Greenwich, England, and conceived by Andrew Stuck. Rethinking Cities provides advice to the built environment, health and transport sectors, so Andrew is in a unique position to interview artists and specialists from the world of walking. Company No. 5801458 We have been trading since 2006. (Turkish) It connects taban (meaning sole in English) and the English word way, thus meaning sole-way.